Eigenmorphism is a neologism which refers to a hypothesis about fundamental laws of how natural phenomena persist in relation to each other. The thesis draws on some principles of General and Special Relativity, Quantum Mechanics, and semiotics, to integrate phenomenal awareness and physics at a fundamental and ontological level. In philosophy of mind, the idea that awareness is something like a fundamental force coexisting with other forces of physics in some way is known as panpsychism, however, within Multisense Realism, the conjecture that is used is an even more radical one. For reasons explained later, MSR uses the term pansensitivity rather than panpsychism, and it conceives of forces of physics to be second order divergences from the fundamental and irreducible capacity which is assumed to act as the common parent of all action and all being, all feeling and all knowing. This is not to be confused with a creationist account or theism, as it does not assume a single being who is human like and feels all and does all, rather primordial identity pansensitivity (PIP) is a weaker assertion that claims only that it makes more sense to view the cosmos, or at least the sense that the cosmos makes to itself, as originating from an agenda which is aesthetic and participatory rather than one which is automatic and functionalist. “The combination problem for panpsychism is: how can microphenomenal properties combine to yield macrophenomenal properties? […] The combination problem can be broken down into at least three subproblems, […] These three aspects yield what we might call the subject combination problem , the quality combination problem, and the structure combination problem. […]The subject combination problem is roughly: how do microsubjects combine to yield macro-subjects? Here microsubjects are microphysical subjects of experience, and macrosubjects are macroscopic subjects of experience such as ourselves. […] An especially pressing aspect of the subject combination problem is the subject-summing problem [in principle it seems that a macrosubject would not necessarily emerge from microsubjects]. […]The quality combination problem is roughly: how do microqualities combine to yield macroqualities? Here macroqualities are specific phenomenal qualities such as phenomenal redness (what it is like to see red), phenomenal greenness, and so on. It is natural to suppose that microexperience involves microqualities, which might be primitive analogs of macroqualities. How do these combine? An especially pressing aspect of the quality combination problem is what we might call the palette problem [..] How can this limited palette of microqualities combine to yield the vast array of macroqualities? Panpsychism has already suffered from a somewhat dubious reputation in the past, perhaps because it is often conceived of in simplistic terms by those unfamiliar with it. In many minds, panpsychism is presumed to imply a cartoonish idea of nature which imbues every speck of dust or atom with a human-like mind. While there may be no philosophical justification to rule out such a view, I think that all of the common forms of panpsychism offer far more sophisticated ideas. I would consider any view which disregards the primitive nature of microphysical systems relative to macrophenomenal states to be more of an anthropomorphic panpsychism; what I call pananthropism, There are weaker forms of panpsychism, such as panexperientialism or panprotoexperientialism which do honor the difference in complexity between micro and macro scale phenomena, but these forms also dilute the effectiveness in resolving the Hard Problem of Consciousness. If we say that microphenomenal states aren’t really phenomenal or subjective, then we still are faced with having to explain why and how they become that way on the macro, human scale. In between the two extremes, I introduce the word ‘pansensitivity‘, which posits a universal minimal capacity for sense in naturally presented phenomena (not phenomenal representations). This sensitivity operates within its own scale and inertial frame of reference, and need not be very similar to human consciousness. Inertial frame is intended literally as well, as part of the hypothesis includes the idea that experiences themselves accumulate and take on a kind of gravitation-like tropism, similar to Rupert Sheldrake’s Morphic Resonance and David Bohm’s Implicate Order, which I refer to within MSR as Solitrophy, If solitrophy is the world builder, then significance (the nesting of representation within sensed presence) is its bricks and mortar. Pansensitivity need not have a subjective or self-like quality, only a univeral commonality of being and doing which is rooted in sensory-motor participation. By emphasizing the primacy of perception and participation as the heart of all possible experience, pansensitivity lays the foundation for a full scale integration with physical conjugates such as mass-energy, space-time, electro-magnetism. Additional conjugates from information science and mathematics integrate smoothly as well, such as form-function, signal-noise, geometry-algebra, and ordinality-cardinality. The consequence of moving ‘down’ from panpsychism to pansensitivity would be the loss of the anthropomorphic baggage imposed on primitive phenomena, and the consequence of moving ‘up’ from panprotoexperientialism would be to un-ask the Hard Problem on the micro-level. Starting from the hypothesis that all phenomena are sensed or sensing phenomena*, and that nothing can said to be exist beyond the scope of sense, the entire Combination Problem is turned on its head to become one of breaking apart rather than merging together. Because all distinctions of micro and macro, phenomenal and physical are subsumed within the absolute primordialism of pansensitivity, we must employ a different way of thinking about the Combination Problem entirely. This revision of thought extends to a re-imagining of some of the underpinnings of mathematics and cosmology. In all respects, where recent Western views assumes a universe from nothing, or an arithmetic beginning with zero, primordial pansensitivity supposes the opposite perspective; a multiplicity carved out of unity, a near infinity of quantities diffracted as ratios within the number one. Separation becomes the derived local condition, while singularity is the absolute fundamental condition. It is not ‘a singularity’, or ‘a universe’, it is The singularity, and The universe. Because the orientation of this model flips the traditional ranking of physics and phenomenology, and awareness is the sole defining principle, Professor Chalmers three subproblems would have to be restated to assume divergence rather than emergence. Emergence would be the local appearance of diffraction of the single whole rather than combination of isolated parts. At this level, PIP can be considered a form of idealism, in that the head end of the Ouroboros is phenomenal presence and the tail end is diffracted by time (subjective self), space (objective matter), and sense itself (represented information), however the very categorization of sense as ‘ideal’ is a materialistic bias which draws on Platonic notions of information supremacy rather than the sensory supremacy envisioned by PIP/MSR. Sense is not an ideal, it is concrete. It moves bodies and births galaxies. The sense of the human intellect is idealizing. Our mental life is a special case as far as we know. The rest of the universe does not seem to strive for perfection, it simply presents itself as perfect or imperfect by default. The human mindscape, by contrast, is often fixated on perfecting forms and functions, removing entropy from signal. When we consider the relation of the colors of the visible spectrum to white light, we can get a sense of how singularity and multiplicity coexist qualitatively, and how that coexistence differs from quantitative-logical structures. The difference between projected light and reflected color is instructive. As we know, converging three spotlights of competing colors gets us closer to white in the overlap, while mixing three paints of different colors gets us closer to grey or black. Similar displays of order can be found in the other senses as well, with harmonic progressions and white noise within sound, and other symmetric patterns which circumscribe the palette of olfactory sense. The palette of the color wheel, however, is uniquely suited to modeling aspects of sense combination. We might as why that is. What makes vision seem more fully exposed to us than something like smell? How does the neurological emphasis on visual sensitivity translate into this ‘seeing is believing’ sense of trust? In particular, the color wheel or visible spectrum presents two themes within palette formulation. The first I will call the prospectively sensible theme. If we had never seen color before, and were presented for the first time with green and blue paint, it seems plausible that we could imagine a color in between green and blue as being turquoise or cyan. If we were presented with red and green paint instead, it seems completely implausible that anyone could imagine the existence of the color yellow. Yellow is not ‘prospectively’ sensible. Once we see yellow however, and see the flow of the visible spectrum as it progresses smoothly from red to orange to yellow to green, the quality of yellow seems to fit in perfectly, so it is retrospectively sensible, In this example, cyan has both prospective and retrospective sensibility, but yellow only has retrospective sensibility. This gives the origin of yellow an unprecedented quality. I call this idiopathic property, which is common to all sense palettes, the ‘genius’ of the palette. The genius provides tentpoles, primary differences in kind from which secondary and tertiary differences of kind blend seamlessly into a multiplicity of differences in degree. There is a view of the territory of the pansensitivity’s version of the Combination Problem (or primary Divergence Problem). The problem of the origin of palette genius is still an issue, but it is an issue which is diffused somewhat by the totality and unity of primordial sense, and the inversion of our expectation of nothingness rather than primordial everythingness. These genius qualia are manifestations of sense which may be more primitive than spacetime itself, so that the ingression of spacetime leaves certain critical pieces to the puzzle missing. Simply stated, the whole idea of causality and origin depends on time and sequence, so that these primary colors and sensations are as fundamental as sequence itself, and as any question that we can ask about it. Questions themselves are presumably no more fundamental than these elemental experiences. Once a palette of sense has diverged and multiplied into spacetime availibility, it is proposed that the role of subjective participants is to recover unity and simultaneity, completing a kind of sensory-semantic conservation cycle (which is also a palette of sense). The hypothesis of combinatory eigenmorphism is that the relation between any and all phenomenal experiences, whether they are cognitive, perceptual, or physical, can be characterized by specific categorical differences which are themselves ordered in a sensible schema. Borrowing the eigen- prefix, used in terms such as eigenstate and eigenvector, and the root ‘morph’ as it is used in isomorphism and homomorphism, eigenmorphism is intended to describe an ordered set of elementary mappings within a closed continuum of possible mappings. Comparing two compasses, for example, the closed continuum of possible mappings would be the 360 x 360 degree matrix of possible needle direction combinations. Only one type of combination (a group of 360 out of the total 129,600 combinations) would be isomorphic, with both needles facing the same direction. Another group of 360 would be anti-isomorphic (one compass needle points North and the other points South). In between these two poles would be various shades and angles of disagreement. The right angles would be in perpendicular disagreement to both the isomorphic and anti-isomorphic combinations. The use of eigenmorphism here is not intended as a mathematical abstraction, however. There may be more precise terms within algebra or geometry to describe such a rotating cycle of polarization stages, but the point of using morphism here is not to limit the combinations to one dimensional differences. Unlike a geometric degree or radian, this usage of morphism must apply to every kind of difference between any phenomena, not just to differences in shapes or orientation. This is potentially possible because of the holism of primordial pansensitivity. The divergence of every singularity into multiplicity can be described as tectonic – every diffracted palette and diffraction within a palette is like Pangea, breaking into continents which fit each other like puzzle pieces. Adages like ‘as above, so below’, and ‘opposites attract’ can be grounded in this foundational continuity. Eigenmorphism must, therefore, apply not just to mathematical transformations, but to fully realized sense experiences, complete with personal participation and felt content. If we extend the compass metaphor and imagine that on the top of each compass is a tiny video screen which shows the other, and that the position of the needle determines the composition of that video image (not just brightness and contrast, but focus, size, realism, etc), we can begin to get a sense of what is meant by eigenmorphism. It is intended as a common schema to unite quality and quantity, or in Deleuzian-Bergsonian terms, differences in kind and differences in degree. The full conjecture of eigenmorphism is that differences in kind are orthogonal to differences in degree, but that they are both part of the same cycle of sense which discerns all difference and through that experienced discernment, effects a reproduction of order which is expressed through all phenomena. To be clear, the scope of the juxtaposition of this schema is absolute. We are comparing poetry to baseballs, and deja vu to carbide steel. The goal is to recognize a subtle framework which weaves together all phenomena, whether physical, phenomenal, or semiotic, and on the scale of the microcosmic, macrocosmic, or cosmic. Eigenmorphism can help organize, in one conceptual framework, the relation between micro and macro scales or across physical and phenomenal lines, where similarities may be found only in the extremity of their incommensurable difference. 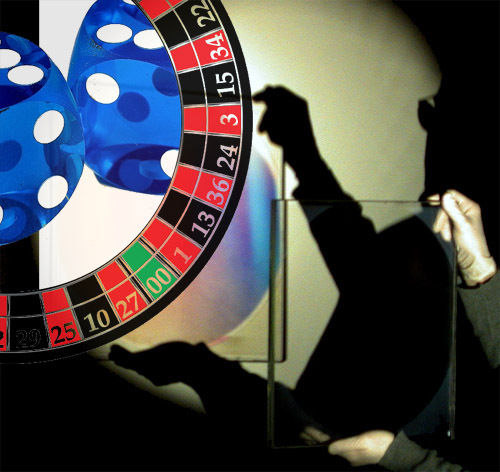 Eigenmorphism is a response to Einstein’s famous quote “God does not play dice with the universe” in disbelief of Quantum Mechanical probability, God plays dice, dice plays God but only sense can make a difference. Language provides a good example of how physical objects and experience can coexist seamlessly within a single schema. Onomatopoetic words like bang! or pow! rely on high degree of isomorphism between 1) sounds that we hear, 2) sensible generalizations of those sounds, and 3) sounds that can be spoken. Such sound-alike words are more universal than other kinds of words, as they require no translation from language to language. People of all ages and backgrounds intuitively understand that these words refer directly to events associated with those sounds. It seems likely that language itself must have originated with this kind of imitative behavior – the recording and replaying of sounds and gestures. The combination of literal imitation (bottom-up) and figurative association (top-down) yielded more abstract metaphors with more eigenmorphic combinations. Complex communications extended the step of sensible generalization (2) and, perhaps surprisingly, made communication and representation more difficult to separate from that which is represented. With each extension from the literal to the figurative, the poetic and the abstract, we effect certain translations, each of which stand on their own as sensible connections, and which take their own most sensible places in the universal context. Again, going back to the color wheel. Each hue and shade makes sense as its own unique individual experience, and as a mathematical vector within any number of sensible topologies (wheels, cylinders, cubes, parabolas, triangles, etc). It makes sense in many different ways, including the intuitively idiopathic sense of its palette genius. Within language we find a vast context of meanings which have developed accidentally and intentionally, intuitively and counter-intuitively. Conventions of grammar and spelling reflect similar mixtures of logic, intuition, spontaneity, and inherited formalism. Beneath all of these is a semiotic foundation. To communicate is to represent, and to represent is to infer comparisons among subjects, objects, other subjects, and other comparisons. To discern differences between ‘things’ implies first a capacity to sense ‘things’, and to experience sensibility itself – an expectation of presence and participation. Semiosis is a particular cognitive version of what I suggest is this fundamental sensibility; the capacity to mentally record and generalize or iconicize perceptions, and to record those essentialized perceptions to be abstracted further. If information is a perceived difference that makes a difference, then information itself depends on a more primitive capacity to discern difference from indifference, to care about that discernment, and the power to do something about it. The polarization of afferent sensory receptivity is the power of efferent motive projection; to participate intentionally in some way which promises to have an effect on what has been sensed. This, to me, is the ultimate firmament of all metaphysics. The universe is an eigenmorphic-relativistic singularity of all experience, and experience is a nested multiplicity of sensory-motives. Eigenmorphism assumes this universal continuum of sense in which the degrees and kinds of nestings deform the context of perception itself. As mass deforms spacetime in General Relativity, experiential qualities warp experiential perspectives under Multisense Realism. 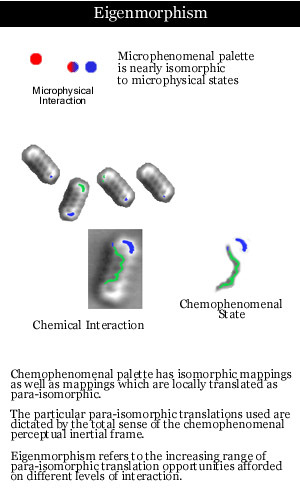 Rather than assuming a one-to-one, isomorphic relation, in which, for instance, a particular neurotransmitter’s binding in the brain equals a particular particle of a subjective experience, there is a lattice of translation which shifts in direct proportion to the scale and nature of the pairing (micro to macro, private to public, familiar to foreign, etc). As macro scale entities, our human scope is dictated not only by size and frequency of our conscious frame-rate relative to other experiential entities, but by the character and history of our intentional participation. If we want to put a Buddhist twist on it, it could be said that karma is the gravity of consciousness, and eigenmorphism is the warping of consciousness that mirrors back its own warped condition as well as the phenomenal translation of all external conditions through that lensing. As Relativity uses the concept of inertial frames, eigenmorphism describes the holistic constitution of experience. As a prism can be seen to split a beam of white light or combine beams of colored light into one, our human experience unites the spectrum of zoological, biological, chemical, and physical experience. We can choose to see ourselves as animals, or meta-animals, or temporarily embarrassed deities. Our personal experience is proprietary and unique not just to the fingerprint or genome, but to the irreducibly absolute. The primordial pansensitivity hypothesis predicts that every experience, while seemingly composed of reducible, recombinant elements, is actually its own solitary universe – a vector of sense which cannot be reproduced completely. It is proposed that appearances of generality and duplication are a local effect, an artifact of eigenmorphic translation from plurality to singlularity in which the discernment of differences is necessarily truncated at an appropriate level. We can see this, for example, in how we look at sand on the beach, and generalize the grains of sand in our mind. Under a microscope, we can see more of the unique character of each grain. Because we assume that sense is primordial, we can predict that the microscope too has its limit, beyond which discernment falls to zero and that which we are measuring becomes indiscernible from the instrument being used to measure. The pansensitive conjecture equalizes unlikelihood and inevitability in the totality, since it is not within the entropic displacement of spacetime. Within spacetime, probability is a mechanistic absolute, but that conditionality is, under eigenmorphism, a local inversion of the larger conditions of non-probability. Like the yellow and the cyan, the expectation of predictable order is itself emergent from utter unpredictability. Probability is a palette genius. Because the assumption of the improbable is taken as an anthropic necessity of all possible universes, the unlikelihood of life in the universe is nullified. It is not certain physical conditions which give rise to life, it is life experience which is expressed through certain physical conditions. By analogy, Shakespeare did not arise from the combination of certain words, vast groups of words were employed by Shakespeare to express human stories. As a rule of thumb, the closer the scale of forms, the greater the range of possible eigenmorphic relations. Bodies which are of similar size and private experiences which share similar histories and qualities have more potential kinds of relations and more degrees of relation than phenomena of disparate scale or history. From our perspective, it appears that entities which are on the extreme range of scale in the universe like subatomic particles and galactic superclusters seem equally unlikely to host any kind of awareness. It could be that this is objectively** true, even beyond the prejudiced relativity of our human scale eigenmorphism, but it is not clear that there can ever be a difference between human truth and objective truth as long as we are human. For us, even if stars are bits of the Gods as ancient astronomers imagined, their experience is on such a remote scale to ours that our phenomenal states are inaccessible to each other. More likely it seems that the great and infinitesimal entities do have objectively limited palettes compared with our own, but that those limitations are exaggerated because the eigenmorphic range of our own extended human sensitivity projects its own envelope of significance. Try as we might, the significance of an ant’s life is not on par with a human life, and even if ants looked like human beings, their tiny size relative to our body would make it hard for us to take them seriously. This is all part of the natural intuitive ordering by scale in the universe. Eigenmorphism describes the character of that ordering. There are many fanciful ways to imagine microphenomenal or astrophenomenal states. Maybe all such entities are one collective experience just as ours is a collective experience of neurons, maybe there is only one proton-star experience and only appears to replay within the stories of younger, more mid-sized entities. It’s just as likely that microphenomenal states are unknowable, alien, and not worth thinking about. The degree to which we feel that another entity is capable of feeling could be called its pathetic constant, as it remains constant according to form/scale. The more familiar something is to us, the more we ‘like it’ and it is ‘like’ us, the higher the level of empathy we can sustain for it. The pathetic constant which we have to ourselves, ironically may not be as high as that which we reserve for those we admire. That kind of super-significance is a whole other story, but for the purposes of this consideration, it can be said that the pathetic constant toward the idealized self would be the maximum. While bigotry may allow some humans to feel that other humans are less worthy than other members of human society, this prejudice manifests as hatred and fear rather than a low pathetic constant. A true low pathetic constant would be associated with impersonal insignificance rather than personal malice. Human history points to instances in which certain animals or objects or bodies of dead nobility were revered with high pathetic values, but human societies in general tend to support a general pecking order of pathetic values which place humans before most animals, most animals before most insects, most insects before mold, and mold before minerals. We seem to have an idea about what is ‘like us’ which is relatively free of cultural variation, even if we choose to intentionally prefer one entity into a higher caste. This may seem a trivial observation, or that this folk hierarchy is derived from mechanical measures of complexity and familiarity, and on one level that might be true, however it becomes necessary, when considering the sentience of technologies like artificial intelligence, to have a place to start. The pathetic fallacy is one where human experiential qualities are attributed to an inanimate object or machine, i.e. ‘the camera loves you’. Even the most ardent supporter of Strong AI must admit that at some level, say, the level of a trash can lid which flaps down to “say THANK YOU” every time a tray is removed, there is a gap between the appearance of the behavior to a human audience and the subjective intent behind that behavior. We can understand that the trash can lid is in fact motivated by tension of physical materials, not politeness. Since we assign to the trash can a pathetic constant which is absolutely minimal, we do not read into its behavior personally, and the eigenmorphic relation between any proposed internal state of the trash can and the polite behavior we might interpret is null; any attribution of meaning between what we experience and what the trash can experiences is purely one-sided and non-coincidental, or else super-signified as part of a manic or psychotic episode. Should the polite words ‘Thank you!’ come from a human being instead, there is a much more rich field of eigenmorphic mappings to use for interpretation. The meaning of the exchange can range from the trivial and impersonal, as in the case of a consumer transaction with a public-facing employee of a corporation. or it could be heartfelt and genuine, even life changing under some circumstance. The aperture of possibilities is open where the pathetic constant is maximized, as it is those who you most resemble or would like to resemble can hurt you or heal you most. In the case of the trash can lid, the intent is for the exchange not to be examined very deeply. For the operators of such restaurants, superficial gestures of politeness support an impression of ‘good service’, particularly in a mechanized and personally impoverished environment of a fast food outlet which some might find unpleasant if the impersonality of the operation were fully disclosed. This ‘polite face’ is functionally similar to the GUI which modern computer systems employ, which dresses up a command line interface which the general public may find difficult. Of course, even the command lines are a polite face superimposed on the more mechanistic levels of hexadecimal or binary code, and finally microelectronic switch configurations. The phrase user-friendly refers to enhancements which are intended to increase the pathetic constant in public facing systems, promoting psychological ease, as well as more intuitive functionality. It’s interesting to note the role that scale and frequency plays in this. A cell phone would not be very user-friendly if you could on use it the same distance away that your computer screen sits from your face. The binary code is roughly isomorphic to microelectronic switch configurations, or any Turing machine’s configurations. So much so, that there is a branch of computing devoted to developing programs from languages based on bit geometry rather than conventional number representations. The future of nanocomputing or quantum computing may use code that looks very much like what it is and what it does. For now though, the relation between digital bits, and between binary 1’s and 0’s remains slightly more abstracted than the nearly absolute isomorphism of embodied computation. It is important to realize that on the microelectronic level, where the pathetic constant approaches zero for most of us, our commands and programs are not understood by the electronics (or gears or punch cards). Like vast collections of trash can lids, the physical components of any machine are involuntarily moved and changed intentionally, by us, from the outside. The hammer hits the bell, the bell jiggles the float, and so on in Rube Goldberg fashions of mechanical interaction among objects in space. What is the difference between outside-in and inside-out interaction? Some have argued nothing. Philosophical arguments from Leibniz to Searle notwithstanding, the appearance of the brain as a physical machine is so persuasive and complete that for many, the prospect of empathy emerging from mechanical complexity alone seems to be the only possibility, and a possibility which, from their perspective, is undeniable. We see neurons firing, and it reminds us of a computer. We see software running and it reminds us of our mental experience. Case closed. The pathetic constant is pushed to the maximum, organic and inorganic process become identical, and all eigenmorphism is collapsed to isomorphism…the trash can lid becomes, at least to some small degree, polite. This is the kind of panpsychism that we should avoid. Not only for the sake of poor computer scientists who would automatically become guilty of atrocities in developing experimental beings, and not for the sake of human supremacy, but for the sake of understanding the whole truth about presentation and representation. Eigenmorphism is a difficult to conceive of properly without fully comprehending the implications of panpsychism, pansensitivity, primordial identity, and perceptual relativity. The idea that both General Relativity and Quantum Mechanics both expose opposite poles of what is ultimately identical with ordinary perception can be used as a basis for modeling a translation lattice. This envelope or matrix of perception which unites the microcosmic and the astrophysical, acts as a lens through which all subjective and objective appearances are presented. Like the eigenstates of QM, the relation of experience to itself has selective positions, settled inertial frames which evolve and recapitulate their own evolution. Participatory sense provides a richer context than mathematical spaces, so that forms and functions are only the publicly measurable tip of an immeasurable iceberg of private appreciation and participation which is unbounded by spacetime. *that there are no proto-phenomenal or non-experienced properties possible, since ontology itself is treated as supervening on sense. **true objectivity would require that we discard eigenmorphism, as only the absolute frame of reference would be without relativistic distortion, but objectivity requires that some sensory translation is objectifying another sense experience. Having no other sense experience to translate, the absolute frame can only diagonalize its own diffraction within itself. The vast majority of your post, I very much regret, passes above my head. Yet, in general terma, I acknowledge the need to enquire into phenomena that are fundamental to our experience of existence. You have all the courage of pioneering curiosity. Your work has purpose and potential. Yet can we ever approach to a knowledge of the relation of consciousness and what we perceive as reality? Consciousness is the very tool which enables us to do this exercise in elaborate navel-watching. I ask, therefore, whether it can ever reveal its secrets in any consistency that we can be aware of. To attempt to do so is the very converse of the subject of enquiry. I do not know, and can never know, whether you see green as I do. I do not even know if you are conscious. It is remarkable that conscious will summons all the forces of nature to raise a little finger or perform any act. Or so it appears. Immediately this paragraph presents another observation of the operation of consciousness, and so on…. It is impossible to keep up. It is thus evident that no system of enquiry can be complete and any consistency it acquires is derived from obsevation. That every number has a successor, for example, derives from the observation that when I place one pebble beside another I get two. It does not explain why i do not see three as a result of the action or any other number. Despite these limitations, the human spirit enquires and explores. It must. I wish you Bon Voyage! I only wish I had the mental acuity to come with you. Thank you for your comments and wishes. Don’t worry, this post is even over my own head, in a sense. Sometimes I’m not sure how much gels together in the end but I want to get it down in whatever form I can. The thing about sense is that it contains its own seed of transparency. As you say, we can’t know for sure if our green is someone else’s green or if they are conscious, but in another sense, we know enough that it doesn’t matter. That we can even feel that we can ever know or know enough to doubt that we know is enough. That difference, even if it is almost absolutely insignificant, is, in its own context, almost infinitely significant. I’m not claiming any special knowledge at all. I have had some interesting experiences, but mainly I have had a lot of time to think about these things, and at some point I started blurting out what seems to make the most sense. It may not be a solid system of enquiry, or even a completed philosophical idea, but it seems to have consistency and plausibility beyond other perspectives that I have entertained. I like your observation about pebbles, and very much agree. I have mentioned in several posts on here that it seems that mathematics originates in pattern recognition relating to the groupings of objects – that it is a fundamentally anti-subjective bias. To learn to count on your hands is to learn to represent each unique finger as a generic, interchangeable digit. An innocent talent, but the consequences are tremendous. Through contemplating this MSR view of awareness and the universe, I have sort of done a 180 in my assumption of technological singularity, and see instead a final wild goose chase, with consciousness quite literally chasing its tail, information. You really outdid yourself on this one! With this blog post, Multisense Realism moves another step away from conceptual poetry towards a rigorous, model-like vision of reality. Reading it, I felt not unlike Winston Smith reading Emmanuel Goldstein’s “The Theory and Practice of Oligarchical Collectivism”; a wave of recognition illuminating the myriad unexplained phenomena of daily life swept over me. If God had given Moses an essay like this on the tablets, I think a lot more people would take traditional theism seriously (I certainly would). Were it really written by God, the Bible should read a lot more like an existential user manual (The Idiot’s Guide to Reality, perhaps) than a collection of Aesop’s fables. I think what you (and some other really inventive thinkers on the internet) are doing is a fundamental shift is the way philosophy (and science) has been done at least since Descartes and maybe since the Greeks. Ultimately, there are two modes and processes of understanding: categorization and association. This polarity has many conceptual analogues: left brain vs. right brain, logical vs. creative, linear vs. non-linear, reason vs. intuition. etc. Most of these dichotomies imply an incommensurability between two modes of thinking, such that, categorical thinkers come to distrust associative thought while intuitive people suspect that the linear minded often can’t see the forest for the trees. It’s the difference between knowledge and wisdom. The truth is, as with all polarities, the necessity of the opposites demonstrates their fundamental unity as co-dependent modalities. Essentially, philosophy has been in the categorization business for a long, long time. And why not? Philosophy has been a gravity-well for the lefty-ist of left brained people since time immemorial. As such, philosophy has reached a moment of categorical closure. The ideas are all there, laid out and labeled, their necessary dichotomies articulated and argued for. And so, being a dualist is defined by its disassociation from materialism, a utilitarian committed as much to not being a Kantian as he is toward his active belief in preference satisfaction, a nominalist compelled to reject realism as a matter of course. This has been going on a long, long time and, with the internet especially, humanity has essentially exhausted its ideological repertoire. Multisense Realism steps outside this game, indeed outside of categorical philosophy, to begin articulating the project of association. Instead of enumerating all the ways the various philosophical views are incompatible, MSR seeks to unify them all, by a rigorous teasing out of all the background assumptions that each view tacitly makes which are the actual variables that compel intellectual consent toward one side or the other, fundamentally. Since beginning to think about MSR, what has struck me is the way that ALL serious philosophical (and even scientific, and perhaps mythic) views can be right, or “right enough.” MSR presents a unification of human thought that is threatening to the left-brain imperative to be categorical (not to be confused with the categorial imperative, natch). Up to now, philosophy has been unearthing conceptual dualities, not unifying them. The challenge of unification, the reason it hasn’t been attempted until recently, is, among other factors, that the pieces of the puzzle were too jumbled and disorganized (and undiscovered). Like working on jigsaw, you first start to organize your pieces by color, you look for the edges, you begin to see structure and shapes, and only then can you then start to make the image click into place. To propel the mind to a high enough vantage point for an adequate intellectual survey, the whole of human thought needed to be seen together, linked through time and history; only then could the answer to the riddle emerge in consciousness. The price to pay for this (or the gift to receive depending on your point-of-view) is that the thing that ultimately has to be negated, or “re-contextualized” in order to generate the ultimate synthesis of MSR is our own sense of self. One’s ontological identity becomes divorced from culture and even zoology. Sense recognizes itself as sense. It’s self-consciousness understanding that it’s JUST consciousness of self. The end point is the same as the beginning. The modern intellectual tradition places a kind of conceptual barricade around the self, a fundamental sense that one can carve the world into “real” things and “me.” (Calling this the ego is a tad simplistic, but it will suffice.) That tree is in the world, but my thought “that tree is pretty” is in “me.” My thoughts, my feelings, my physical sensations are not objective objects in the universe. You can explain the phenomena of the “objective” world, or you can explain the phenomena of the human world. You can even do science about both. What you can’t do, up until now, is bridge the conceptual gap between the two. And make no mistake, what keeps the bridge from being built is not only ignorance (though there is plenty of that), but anxiety. In human history it is the spiritual traditions that have offered a model of the world which bridges the epistemological gulf of “me” and “it,” but, that mode of thinking has always been intuitive (or authoritarian) and rooted in the “faith” of experience as a guide to truth. (Religion is, in many ways, a resignation that we don’t know what the hell is going on. The “certainty” of religious believers mask a radical uncertainty about the world.) Most contemporary spiritual people believe that science and religion are fully reconcilable, but they rarely propose serious conceptual models that explain how. Secular people, conversely, often can’t even see that the problem is there at all, and for good reason; to see it threatens the self which protects the system from the existential disequilibrium that comes from objectifying one’s subjectivity. Make no mistake, there are strong psychological forces at play that keep minds from wanting to understand themselves in a “systematic” way. The “motive-partcipation” force (aka what I call “the Will”) wants always to inflate its sense of control over the world, but, objectifying the subjective demands a willingness to comprehend more realistically how a mind’s current state was determined by the past. Not YOUR past, THE past. Sensing a threat here, many stoic-minded people jump to the end and admit defeat: determinism has to be true. But determinism is a psychological escape hatch, essentially a belief that ends conversation and ultimately eliminates the self’s persistent sense of ultimate responsibility while never directing behavior the way other “actual” beliefs do. Thorough going determinism is a belief that operationally can’t be believed. But MSR is a different beast. Here, the determined past from the big bang till the present has generated your current conscious state, and as such you are deeply chained and bound, but the principle of freedom, of motive and participation, remain. Experience takes on a quality of hysterical contingency: “I’m here now. I can do what I want. But I don’t seem to have proper information to know what I should want, let alone do, nor how I got here.” Historically, at this existential impasse one either goes mad or becomes enlightened. Either way, there is usually a distancing in the subject from the normal games of human civilization; the carnival of history is always located under the tent of ego and it’s myriad (and intrinsic) ontological and epistemological illusions. These are usually subconscious, or, as I like to think, hyper-conscious, that is, the beliefs of the ego so infuse the regular coordinates of most human experience that they “color” the whole of consciousness and as such are difficult to see directly as the “artificial” constructs they are. What is changing is that the loose and koan-like language of spiritual thought is beginning to be complemented by a rigorous, deductive, “analytical” vocabulary which, though approaching reality from a different approach, is hedging toward (some) overlapping conclusions. If someone says they are interested in “reality” however, we feel much more uncomfortable. Within this concept is a kind of existential depth that immediately threatens. The ego likes to feel that, although we may not know the secrets of the universe, certainly we have an adequate grasp of “reality.” The very existence of the concept “reality,” with its totalizing undeniability, implies a kind of conceptual truth at the heart of things, a truth which, intuitively, can’t be contained by a “universe” or “a multiverse” or what ever rococo spatiotemporal model you choose to employ. Reality suggests a unity, not a plurality. Sorry, I meant to reference the contents of your post directly more, but I needed to vomit out all that first I guess. So much more to think about, but, that’s all I’ll say for now. When I read this post a few more times, I’m sure I’ll come up with some questions and thoughts. What a great comment/review! Thanks. I’m going to post it on my blog (http://s33light.org) and here if you don’t mind. The part about puzzle pieces is something that I have thought about frequently myself. I feel like my purpose with MSR is to collect collect the corner pieces and put together as much of the frame as I can. I have found that it’s hard to give a good account of the frame of the puzzle without being accused of not having completed the whole thing. Part of that I think is, as you said, that this new approach uses rigorous language which threatens our expectations. If it’s not a completed theory that produces a new kind of spacecraft then you shouldn’t try to sound like you know what you are talking about. I very much like the parts about stepping outside of the philosophical dialectic, as that’s really the first and most important place to start and I’m not sure that anyone else has even mentioned it. The more important aspect of the mind body problem is not whether they are the same or different or one is part of the other, but that the seeming differences fit into each other like a lock and key. That philosophy of mind’s own polarity of mechanistic materialism vs anthropomorphic idealism fits like the *same* lock and key could not be a bigger deal, yet it is overlooked (in opposite styles, of course) by both extremes. Your thoughts on space are right on the money also, its just kind of hard to express what makes spatial-public experiences different from all of the other kinds of experiences, and how visual sense is the most public facing sense for a reason. There is a kind of exponential slope in the way that qualia drops off into its opposite. Space is zero privacy, so its absolute inspect-ability is identical to its interstitial adhesiveness. The metric is purely adhesive non-entity which is inferred through the cohesiveness of morphic entities in comparison with each other. As far as religion goes, I spent a lot of my life at a loss to explain what is wrong with human beings that they would believe these bizarre stories. Later on, as I realized that religions did have a certain amount of wisdom encrypted in metaphor. It wasn’t until I started stepping out of the whole dialectic that I realized that everything that people say about God really applies to our own consciousness, only idealized to a superlative extreme. That of course is a ‘meta’ thing, since idealizing is actually one of the most significant things that consciousness does (significance itself being idealization and meta-idealization). Within all of the religious hyperbole is a portrait of hyperbole itself, of consciousness, and its role as sole universal synthetic a priori. They just got the metaphor upside down. It’s not a God who is omniscient and omnipotent, it is sense and motive (or Will) which are represented as God or as math-physics. PS I’m curious to check out some of the other people on the internet that you mentioned also. Let me know if there’s any sources online in particular that you recommend. Abstract Submitted for TSC 2014 My comment on Can we trust our senses?